Francisco Guerrero was Alonso Lobo’s musical inspiration, and his teacher from the age of eleven. He was revered by him and exercised a strong influence on the latter’s style and musical aspirations. 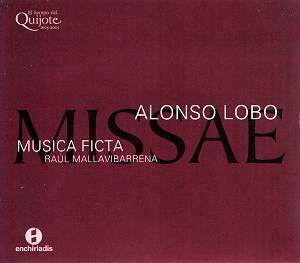 This CD features two masses by Lobo, who was a native of Seville. Each is based on a motet by Guerrero - both are performed here. It was most likely Guerrero’s post of choirmaster that Lobo took over in 1591. Guerrero’s motets were published in 1570 (‘Simile est’) and 1589 (‘Petre ego’). Lobo’s masses following in 1597 - around the time that Lobo was moving permanently back to Seville from Toledo. By then his fame had spread throughout Spain and beyond. The masses are for four voices and are very different in style, soundworld and thematic priorities from the music which inspired them. For all that, Guerrero’s lines are long and sonorous, majestic and dramatic, without being declamatory; Lobo’s are lighter, expressive. They might even be thought imitative of the changes underway towards figurative polyphony, particularly as Italian madrigals were developing. So to listen, say, to the brief Guerrero motet, ‘Petre ego pro te rogavi’, to respond to its gravitas in phrasing and tone; then to work through the more transparent Kyrie from the mass by Lobo makes an interesting comparison. The mass is lighter, immediately chromatic and less ‘tactile’. Not that one need treat this CD as an exercise in comparisons – development and adaptation are just as apt. Music Ficta’s decision to stay with one voice to a part on this recording has paid off. Each of the five singers (Moral and Vicente are present only in three of the movements) is excellent: clear in tone and articulation and bringing just the right amount of expressiveness to the mass settings. There are, though, the faintest of faint hints of a lack of uniformity. For example this can be found at the very end of the Gloria in the ‘Petre ego pro te rogavi’ mass’ and at times in the entries in the same work’s Credo. Why no retakes? The singing is so controlled - witness the way the Sanctus in both works are allowed a jollity but a restrained jollity - that such particularities are hard to put down to spontaneity. Vivo ego, dicit Dominus is a simple, solemn motet for Lent that relishes both the contemplative life and the concept of self-realisation and development. Let that setting make it plain - especially for those new to Lobo - that he is no lightweight. For all that this recording is dutiful to his textural filigree – there is a text of substance, albeit restrained, to be attended to. It’s gentle and beautiful music from which to derive pleasure and uplift. Lobo lacks the depth or richness of Victoria, or indeed of Guerrero but should not be ignored. Lobo is not well represented on current CDs. A good place to start would be The Tallis Scholars - again with Lobo and a Guerrero inspiration: the ‘Missa "Maria Magdalena"’ (Gimell 31). After a couple of listens to either offering, maybe dipping into Guerrero’s own Missa "Surge propera” (Gimell 540) - or for that matter any one of the same ensemble’s Guerrero series, also under Peter Phillips (Gimell), it will be clear that Lobo has a crystalline confidence that repays close attention.